With the huge growth in the Esports industry, the one game that tends to draw the most attention and headlines is League of Legends or LoL for short. Over 70 Million people worldwide play LoL and the top players in the world are in the LCS which is the League of Legends Championship Series. These are “qualifier” esports tournaments played throughout the world in hopes of qualifying to play in the League of Legends World Championships which takes place in the fall of each year. 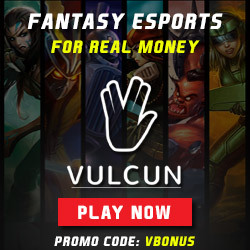 For those that aren’t good enough at LoL to play at the highest level of esports competition for millions in prize money, fans of LoL can still take their knowledge of the sport and play Daily Fantasy eSports (DFES) at sites like Vulcun or AlphaDraft and still compete for real cash prizes. League of Legends is a Multiplayer Online Battle Arena (MOBA) action strategy game where two teams of 5 players fight against each other on a mirrored map (both sides, if flipped, will be identical) to destroy the base of the opposing team. The map shows both team bases and each team begins the game from their own base. The object of the game for both teams is to reach the other team’s base and destroy the Nexus, which is the other teams building. Each player on a team assumes the role of an unseen “summoner” and picks a character, also referred to as champions, to play as. Each champion has their own unique skills and abilities and players can increase those abilities and strengths over the course of the game through kills or other points accumulated. Each LoL match begins with all champions starting off fairly weak but through game-play, accumulating items and experience through the course of the game the champions will grow in strength. At the time of this writing, League of Legends has 127 champions but that number continues to grow. Each of the champions in LoL has a unique set of skills that define their role in the game and who they are. There are various types of protectors, defenders, tanks, damage dealers – each can become crucial in how the strategy of the game is played. Some of the champions work together with each other but they can also work well against others. When picking champions, good players will pair them with champions that work well together as their strategy. Each of the players has a designated role which we break down for you below in this article. Each players role has a special purpose for how a team will play the game. Top players in LoL know that some champions perform better in specific roles when paired with other champions during various stages of the game. There are 3 types of champions: damage dealers, tanks and supports. Choosing the wrong type of champions can turn a game into a loss very quickly and is an important strategy for each team to consider. Using the map in League of Legends, you have 3 lanes which players must fight through on their way to the enemy base. In between these lanes are forests with neutral monsters with various degrees of toughness. By killing them, players get advantages to their powers. Turrets are placed in selected areas of the map to provide a safe zone to protect them from opposing team advances. In the middle of the map is a river which is neutral territory that allows players quick access to move from one lane to another. When players make kills, assists, or creep kills they accumulate points which can be used at a player base to buy items which will upgrade their champions. At both bases is a Nexus which is protected by two turrets as well as three inhibitors. To destroy the Nexus, the inhibitors must first be destroyed but only one inhibitor needs to be destroyed for the enemy team to gain access to the Nexus towers and Nexus – Each individual inhibitor is also protected by a turret. The TOP position plays in the Top Lane against the other Top Laner in a LoL contest. He’s like an NBA Power Forward usually being matched against the other team’s best defender and often battles one on one throughout the game. In League of Legends, the TOP is relied on late in the contest to lead the charge in destroying the Nexus by taking out the opposing team’s strongest player and winning the match. The MID is usually a highly offensive player which excels at getting to or getting away from places quickly while inflicting damage on the enemy players. The Middle Laner can be the most valuable position for all the points they can accumulate with their damage output. The MID position is usually the most expensive player for fantasy esports contests because it is a player that can produce a double digit stat line for kills. Fantasy Esports Tip – Some sites like Draftkings players get bonus points on each kill over ten, so having a MID that has the potential for extra points becomes worth the salary price. Using the NBA Basketball analogy again, the Jungler (JNG) would be considered the Small Forward. It’s a position that fills up the stats by scoring points offensively, but also scores points by denying the opponents as much as possible. A good Jungler has a lot of ability to help out his team during the game, with the threat of offensive scoring potential that has to be dealt with by the opponents. He is usually well hidden and will come out of nowhere when you’re about to take the shot that’ll put you up on the scoreboard. The JNG will be the one that comes from out of the jungle or jumps out of the river to make the block or steal it and then create a score for his team. Basically, the Jungler runs around looking for opportunities to help his team and set up scores in the later stages of the LoL contest. The ADC is usually the star of the fantasy League of Legends team. The ADC has the highest offensive power on the team and is the closer in the later stages of the game by taking towers and dragons much easier. The Attack-Damage-Carry position tries to score as many kills in the mid to late stages of the game to ensure the team’s victory. If a game plays past the 30-minute mark it’s usually because it’s been dominated by great ADC play. How an ADC performs in team fights usually determines whether or not his team will win the match. In the late stages of the game, all meaningful offense is run through the ADC, but also plays an important role in taking early game objectives. They will protect the ADC at all costs during every stage of the contest. The Support role in League of Legends exists mainly to help the ADC position get more powerful and to create plays or chances to get ahead of the opposing players. Like a lineman in football is meant to protect the QB, the SUP is there to protect the ADC and help set up offensive plays as well as helps the team out when there are good scoring opportunities. The Support is typically a defensive position and a helper for his teammates.